[Annual Bay Area anarchist bookfair, 16th] / Hugh D’Andrade. 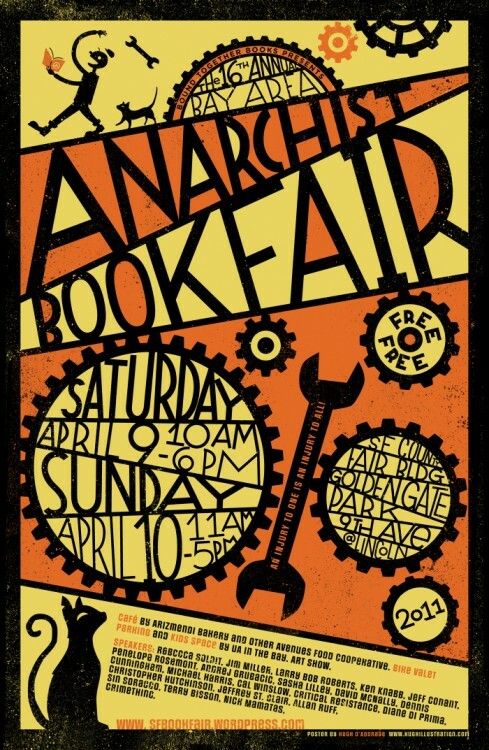 — San Francisco : Bay Area anarchist bookfair, 2011 . — 1 affiche (impr. photoméc. ), coul. (trois : noir, orange, jaune, papier blanc) ; x × y cm. Café by Arizmendi bakery and other avenues food cooperative. Bike valet parking and kids space by UA in the bay. Art show. Speakers : Rebecca Solnit, Jim Miller, Larry Bob Roberts, Ken Knabb, Jeff Conant, Penelope Rosemont, Andrej Grubacic, Sasha Lilley, David McNally, Dennis Cunningham, Michael Harris, Cal Winslow, Critical Resistance, Diane Di Prima, Christopher Hutchinson, Jeffrey St. Clair, Allan Ruff, Sin Soracco, Terry Bisson, Nick Mamatas, Crimething.